Ashley Johnson dreaded going before the television camera. A quiet girl who dreaded speaking in front of people, Ashley became composed and professional the second she was on the television camera. Ashley has always loved writing but an intense journalism bootcamp at Stony Brook University has made her second-guess what she loves more; writing or journalism. Ashley Johnson, 16, took imediate interest in writing when her sixth grade English teacher, Mr.Byrne introduced her to a creative yet challenging world. She then entered the National History Contest with a few friends, where she learned a little about what journalism is for the for the first time It opened up her mind to broadcasting. Ashley tried her school newspaper, The Golden Wave, in ninth grade, but it was not until she took a journalism class in sophomore year when she began to participate and enjoy it. 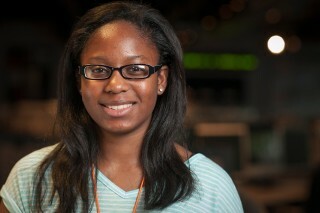 That journalism class is what made her apply for the Robert W. Greene Summer Institute for High School Journalists. Ashley participated in Hoftstra’s Student Press Day, an event that is similar to the one she did at the Greene Institute. On her first day she heard a speech by Tonjanita Johnson, chief deputy to the president of Stony Brook University. Ashley reads to young children at her library every other week, which broadens her experiences in public speaking. But until she had the chance to do a live broadcast and see how loud and clear she was on the Stony Brook screen she was uncertain of her speaking abilities. Ashley looked like she was doing her routine news show when she acted as the reporter. A career choice of a lawyer was once something that Ashley thought possible and got the chance to shadow a lawyer for a day. But ever since she had the chance to explore the fields of English and journalism, she has stayed on that path and her hunger for them has only increased. Playing tennis and badminton as well as doing gymnastics are things that Ashley loves. But when she found there was not enough time for her true passions, she stopped going to some clubs and gymnastics to focus more on them. “I love writing controversial topics, too. I like digging deeper into the moral and truths regarding the subject. There is always a good discussion happening in English,” she says. Ashley also writes about celebrities and compares movies in her school’s newspaper. Her friends describe her writing as “interesting and entertaining”. At the Greene Institute, Ashley has devoured as much as she could about journalism, broadcasting and writing in particular. And she is looking for as many ways as she can further her chances of becoming a better writer, and possibly a better journalist. “I’ve gained confidence and developed more skills that have allowed me to meet new people and be open to learning even more than before,” Ashley said. If it weren’t for Bob Greene’s Summer institute, Ashley may have never realized how professional she is in the field of journalism, especially in broadcasting.